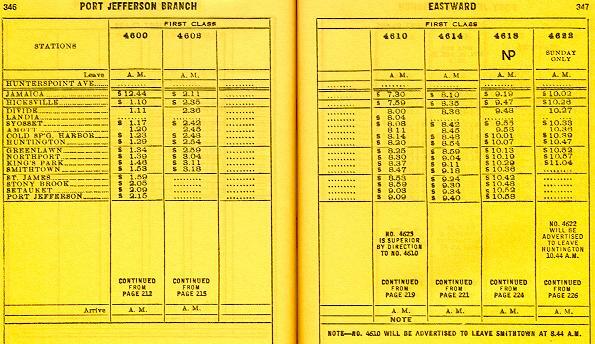 TRAINS SERVING KINGS PARK AND CENTRAL ISLIP STATE HOSPITALS FIRST APPEARED IN EMPLOYE TIMETABLES IN 1911. SERVICE TO PILGRIM STATE HOSPITAL WHICH OPENED IN 1929 FIRST APPEARED IN E.T.T. NUMBER 1, JUNE 24, 1934. THE LAST KINGS PARK STATE HOSPITAL TRAINS - E.T.T. No. 5, MAY 1969. AT KINGS PARK STATION AND RAN WEST AS NUMBER 4647 FROM THE SIDING. 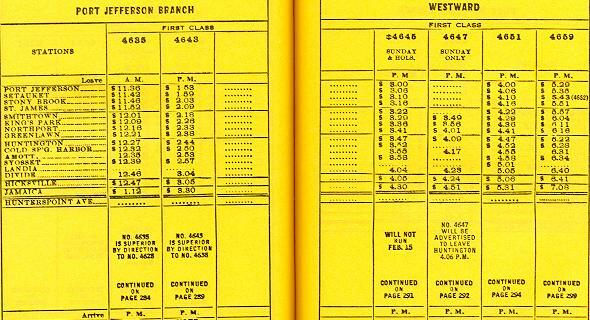 A BUS AND/OR CABS PROVIDED SERVICE TO THE HOSPITAL. THIS WAS THE FINAL SERVICE PROVIDED FOR KINGS PARK HOSPITAL. 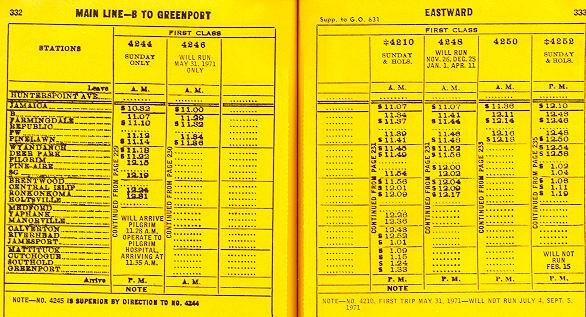 TRAIN NUMBER 4240 RAN TO CENTRAL ISLIP STATE HOSPITAL AND NUMBER 4244 TO PILGRIM STATE HOSPITAL. 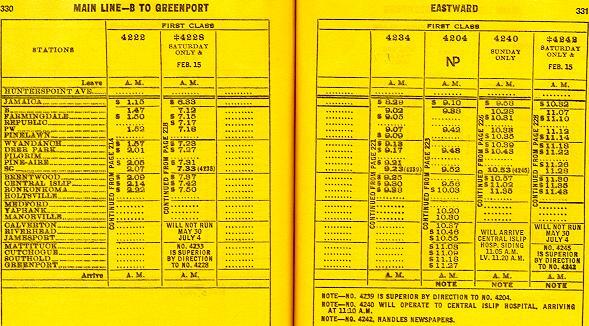 BOTH RETURNED TO THE MAIN TRACK AND CONTINUED TO RONKONKOMA WHERE THE STEAM LOCOMOTIVES WOULD BE TURNED AND SERVICED. DIESELS WERE TURNED THERE. 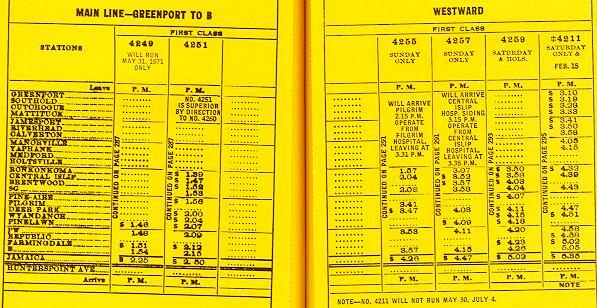 NUMBERS 4255 AND 4257 LEFT RONKONKOMA, BACKED INTO THE HOSPITALS AND DEPARTED WITH PASSENGERS FOR POINTS WEST. 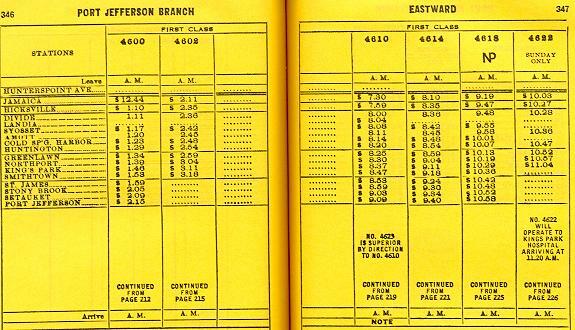 THE SCHEDULES SHOWN ARE FROM E.T.T. 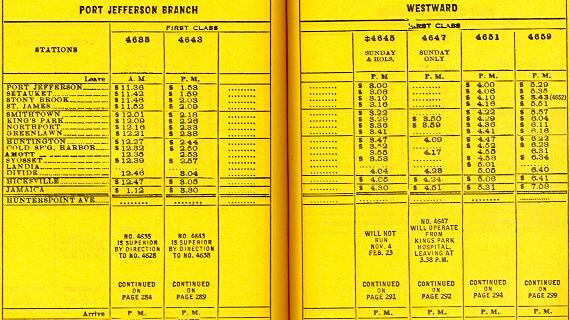 NUMBER 6 OF 1970 AND 1971, THE LAST TWO YEARS OF SERVICE TO CENTRAL ISLIP STATE HOSPITAL.